In Florida, the police can stop a driver if that officer observes the driver commit a traffic violation. This is a detention under search and seizure law, but it is justified based on the fact that the driver apparently committed a traffic violation. Many DUI cases start this way in Florida. However, if the violation is merely a traffic violation, the police officer can generally only keep the driver for the purpose and only as long as it takes to write a traffic ticket. If the police officer keeps the driver for an extended period of time without specific evidence of criminal activity, it is likely a violation of search and seizure law. Another detention occurs when the police officer asks a driver or other occupant of the vehicle to exit the vehicle. A criminal defense lawyer would argue that pulling a person out of a vehicle during a routine stop is an illegal detention. If so, that criminal defense attorney could have any evidence seized thereafter suppressed due to the illegal seizure. In a recent gun case just south of Jacksonville, Florida, the defendant was stopped for having an illegally tinted window. The police officer ordered the defendant out of the vehicle while they had a drug dog sniff the vehicle. When he opened the door to exit the vehicle, the police saw that he had a handgun under his seat. Since the defendant was a convicted felon, he was arrested for possession of a firearm by a convicted felon. In Florida, the police are generally not allowed to enter a person’s home to search or investigate a crime without permission from the homeowner or a valid search warrant. In some cases, the police cannot even go onto your property to search or investigate if the property is properly fenced and it is clear people are not welcome on the property. The right to privacy in one’s home is one of the strongest constitutional protections. However, for homes that are not adequately fenced in, the police are normally allowed to go up to anyone’s door, knock and ask questions. As long as it appears that the general public would be allowed to go up to a door and knock, the police can too. The residents can refuse to answer the door or they can refuse to answer any questions if they do open the door, but the police are welcome to try and knock and see if they can get someone to talk or even let them in. If the residents do not cooperate, the police are not allowed to take the encounter any further, at least according to the law. In practice, the police do not like to take no for an answer and may act accordingly. In any case, if homeowners or other residents do not want the public or the police to be able to just walk up to their doors, knock and try to get information, they need to make it clear that their property is not open to the general public. Fences and gates work well to do this. Signs can as well, but the sign needs to be clear. There was a case in Jacksonville, Florida where a person growing marijuana in his house had a “No Solicitors” sign on his door. He had no gate or fence and no other signs. The police walked up to his front door, knocked, smelled marijuana when the door was opened and subsequently obtained a search warrant. The homeowner was arrested for growing marijuana. Colorado Court Says Alert of Drug K-9 Not Sufficient for Police Search. The Same Rule Should Apply in Florida. The War on Drugs may be the most counter-productive, fiscally wasteful policy in the history of humankind. Yet, it forges ahead, as it does little to effect any change other than to redirect taxpayer money away from beneficial programs and increase the size of government. With regard to marijuana, it is difficult to understand why any police officer would support the War on Drugs. Any encounter with a “suspect” has inherent risks to a police officer. Why would any officer want to risk his/her well-being to determine whether or not someone has a plant, or the flower from a plant? On the other hand, marijuana cases are easy. A police officer smells the distinctive odor of cannabis, searches a person or a vehicle, finds the marijuana and makes an arrest. No thought, no investigative skills, no legwork required. And it counts as an arrest like any other for statistical purposes. It is so much easier and quicker than tracking down reluctant witnesses in a shooting or figuring out where the money went in a fraud case. A recent case out of Colorado will make it a little more difficult for the police to make the easy, simple marijuana arrests that do nothing to benefit the public despite political claims that more arrests translate to a safer community. Many marijuana arrests are the result of a trained K-9 walking around a vehicle after a traffic stop and alerting to the odor of marijuana or some other illegal drug which then gives the police officer probable cause to search the vehicle. If the police officer finds illegal drugs in the vehicle, the officer will likely arrest one or more of the occupants in the vehicle. The entire case can be wrapped up in a matter of minutes. Pursuant to both the United States and the Florida Constitutions, people have a right to privacy in their homes. This means that the police normally cannot come into a person’s home and search for drugs or other evidence of criminal activity without a valid search warrant or consent from someone who lives there. This right to privacy protection applies to homeowners, people who rent apartments and other residents. It also applies to less traditional residences like rooming houses. In a recent possession of cocaine case near Jacksonville, Florida, the defendant was staying at a rooming house along with many other people. The defendant had a room there and a key to the room. He kept his belongings there. The police showed up to the area while responding to an unrelated call. The defendant had a pill bottle that he placed under the rooming house when he saw the police. The police officer became suspicious, walked onto the property, reached under the house and pulled out the pill bottle. He opened it and found cocaine inside. The defendant was arrested for possession of cocaine. The criminal defense lawyer filed a motion to suppress the evidence of the pill bottle and the cocaine. He argued that the police officer did not have a search warrant or consent to come onto the property and take a pill bottle that was under the house. The issue became whether the defendant had a reasonable expectation of privacy in a rooming house in which he was staying. If he did, a police officer cannot come onto the property and take a pill bottle from underneath it that belonged to the defendant. The prior post discussed the difference between a consensual encounter with the police in Florida and something more involved. The police in Florida are free to engage people in consensual encounters to ask questions or make observations, and people are free to refuse to answer questions or otherwise cooperate. Once an encounter becomes more like a seizure, i.e. a situation where the person does not feel like he/she can freely leave, the police must be able to point to specific facts indicating there is evidence of criminal activity to continue. A recent firearms case near Jacksonville, Florida provides another good example of what the law allows regarding searches and seizures in Florida. In this case, the police approached an apartment responding to a noise complaint. They knocked on the door, the suspect opened it and then quickly closed it. It is important for people to understand that they have the right to do this. No one has to answer the door if the police are knocking without a warrant. If a person opens the door and decides he/she does not want to speak with the police or does not want to speak with police any longer, that person can end the conversation. As long as there is no evidence of a crime or a warrant, the police cannot enter the home. Of course, in reality, the police may not be satisfied with that response, but at least on paper, it is permitted. In this case, the police claimed they could smell an odor of marijuana coming from the apartment when the occupant briefly opened the door. While the police were deciding what to do next, the occupant left the apartment and drove away in a vehicle. The police officers followed him and ultimately conducted a traffic stop to ask him why he slammed the door and to see if he had any marijuana in his vehicle. As they were talking to the driver, the police officers saw a handgun partially concealed in the vehicle. They arrested the driver for carrying a concealed firearm. When Does an Encounter With Police Become a Seizure Under the Law in Florida? 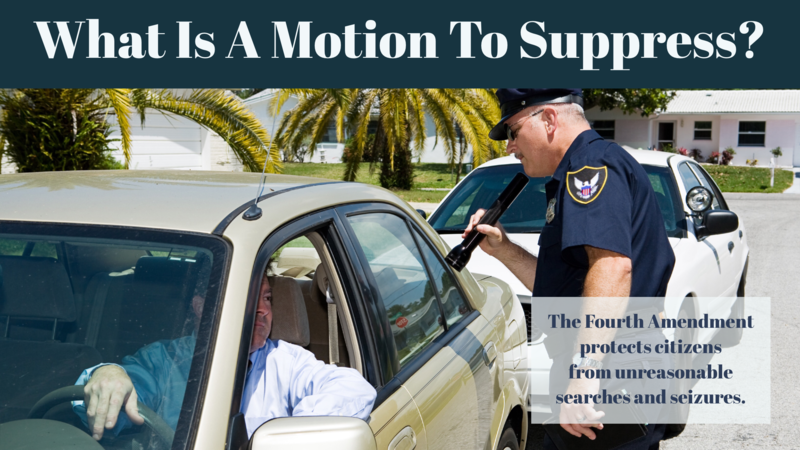 The Fourth Amendment and the Florida constitution provide that people have a right to be free from unreasonable searches and seizures conducted by the state. There are thousands of court cases that interpret what exactly this means in the context of the different police encounters. As a general rule, the police in Florida are allowed to go up to anyone and ask questions, even if the police suspect that person committed a crime and are trying to acquire incriminating information. Of course, that person is free to refuse to answer those questions. The police can walk up to a person’s front door (as long as access is not protected by a gate or other privacy barrier) or knock on a driver’s window to ask questions. If the subject chooses to engage the police and answer, the constitutional search and seizure provisions do not apply. However, if the encounter develops into what is considered a seizure, the police need to establish reasonable suspicion of criminal activity or probable cause or possibly have a search warrant depending on the circumstances. For instance, consider an example where a police officer sees a car stopped somewhere suspicious with the driver inside the vehicle. The officer might suspect something improper or just wonder if the driver is having trouble of some kind. Often, the police officer will suspect that the driver is driving under the influence of alcohol or drugs (DUI). That police officer can approach the vehicle, look into the window and investigate further. The police officer can ask the driver to roll down the window so they can talk. If the driver agrees or voluntarily exits the vehicle, this is considered a lawful and consensual encounter. What often takes this scenario to the next level is if the driver does not respond for whatever reason or refuses to answer the police officer. Normally, the police officer will then order the driver to turn off the vehicle or roll down the window or step out of the vehicle. The police officer might park his/her vehicle behind the other vehicle preventing it from leaving. The key to whether an encounter escalates into something requiring evidence of criminal activity is whether the subject reasonably feels like he/she is free to disregard the officer and leave. In reality, when a police officer asks or tells anyone to do anything and that person refuses or ignores the officer, the officer is almost never going to let it go. However, under the law, there are certain situations which qualify and certain that do not. The examples I listed earlier in this paragraph are generally examples of commands that change the encounter to a seizure and require at least reasonable suspicion of criminal activity. If the police officer looks into the vehicle, asks questions and the driver ignores the police officer, the officer cannot command the driver to exit the vehicle without a legal basis. At this stage, the police officer must be able to point to some facts suggesting a crime is being committed, which would be difficult to do in the DUI context if the window is up. Most people have heard of the “black box” or “event data recorder” after airplane crashes. It is a device that records information about the plane that helps investigators determine how and why a crash occurred. What many people may not know is that cars often have black box recorders as well. Most cars manufactured in the last few years come equipped with the black box recorder. The data on these devices can be used to determine the speed of a vehicle, steering and braking information and other data that can also help determine why a motor vehicle crash occurred. The black box data could be useful to police in investigating certain crimes. For instance, that data could help the police investigate a DUI manslaughter case, a fleeing and eluding case or an aggravated battery with a motor vehicle case. However, the police cannot just go into a person’s vehicle and collect that data. The police might be able to seize a person’s vehicle if it is evidence of a crime. Alternatively, the police might take custody of a vehicle rather than leave it on the side of the road after arresting the driver. In these situations, the police are normally permitted to search the vehicle as part of a legal inventory search- a search of the vehicle to make sure nothing dangerous is in the vehicle and make sure the suspect’s property is inventoried and kept safe to return to the suspect when the case is finished. The black box data are different. Collecting that data is more complicated than searching the vehicle and removing personal items for safekeeping. The key to whether the search warrant requirement is triggered is whether the suspect has a reasonable expectation of privacy in the area or thing to be searched. Florida courts have held that people have a reasonable expectation of privacy in their vehicles and the interior of their vehicles. Florida courts have also ruled that people have a reasonable expectation of privacy in electronic storage devices such as cell phones, Ipads and computers. A black box recorder falls into both of these categories. As a result, if the police want to obtain the data in these black box recorders that are relevant to a crash that involves criminal activity, the police will either need to get a search warrant for the data or get consent from the owner of the vehicle. Failure to do so will likely result in all of the evidence from the recorder being inadmissible in court.